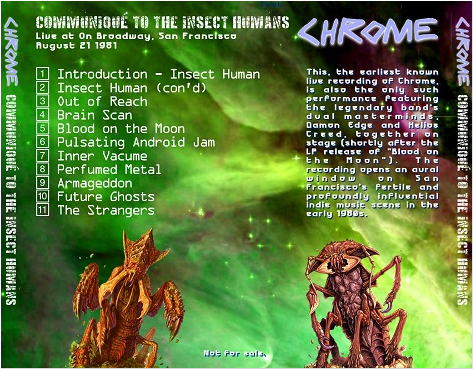 I believe the original Damon/Helios Chrome only played live about 2 times. 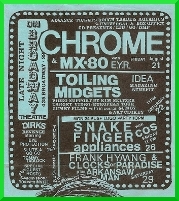 This is the ONLY time Chrome ever played live in the United States! LUCKILY someone there, who I would like to thank personally, recorded the show themselves. The sound quality is surprisingly good for an audience recording (or possible soundboard) way back in 1981. All kinds of samples and things from TV and things, it must have been trippy as hell to be at this show. I have heard that this could be a soundboard recording. 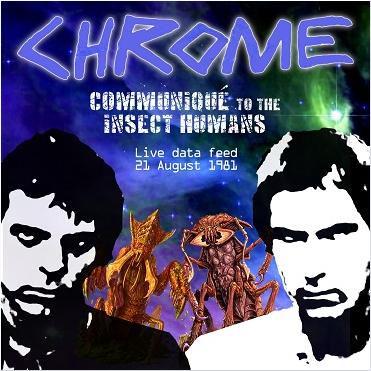 Whatever way this recording was obtained, as Chrome fans we're INCREDIBLY lucky that this rare Chrome show was recorded as one of the only 2 times Chrome ever played live! Need help printing CD Artwork? Click here for an easy how-to set of instructions! 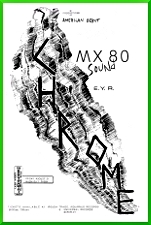 Click here to check out a super rare poster advertising this one and only time the original Helios/Damon Chrome played in the U.S.! 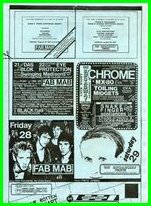 Click here to check out a flyer/bulletin advertising this one and only time original Helios/Damon Chrome played in the U.S.! Click here to see a cutout of the Chrome section of the same flyer!